Good to see John Prescott joining the upper toffs after all these years. Give a class warrior a sniff of ermine and suddenly the workers can look after themselves. Champagne, comrade? Vince Cable claims the coalition is not split over plans to raise capital gains tax to 50 per cent – to which the only answer is that it should be. What are the Cameroon Liberals playing at? A young entrepreneur told me today: “I feel very strongly about this. “Eight years ago, I took a risk. I was offered a good, safe, extremely well-paid job but I set up my own business. As my friend points out, using CGT to hammer people with second homes and a few shares will only leave them worse off and more likely to become dependent on the taxpayer in their old age. Meanwhile the major buy-to-let landlords can afford clever advice to make sure they get registered abroad and probably don’t need to worry about tax at all. There is a terrible irony here. It was a Labour Government which cut capital gains tax to 18 per cent only to discover the reduction was being abused by the very rich, who converted income to capital. But it was still a good idea. It may need reform to prevent abuse – such as the re-introduction of a taper so you can’t cash in on short-term investments. The point has to be, though, that long-term investment and entrepreneurial risk-taking must be encouraged by the tax system – not punished. And if the Conservatives in Cameron’s coalition don’t understand that then we might just as well have voted Liberal in the first place. Much as I loathe Alastair Campbell, it was pathetic of Cameron's "communications team" to refuse to put a Cabinet Minister on BBC's Question Time programme just because the former Labour spin-freak was on it. Is there nobody in the Cabinet capable of taking him on? Is there nobody willing to defend the Government's first week of work just because there isn't a Shadow Cabinet Minister in attendance? Much as I loathe the BBC, the corporation was quite right to refuse to be dictated to. In all the euphoria over the new civil partnership between David Cameron and Nick Clegg, we seem to have forgotten that the Conservatives should be running the country on their own. Mr Cameron had an open goal and he shot wide. He missed out on a majority in parliament and now he has sold his party to the Liberal Democrats. Why did the Tory leader blow it so spectacularly? Why, when he was opposing the most unpopular Government, with the most inept leader, during the worst recession for decades? 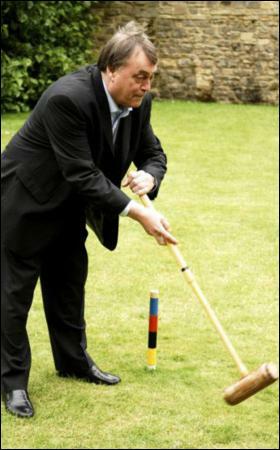 How could Mr Cameron have missed? One answer is that in his desperate desire to cosy up to the Liberals even before the election was called, he betrayed his own natural supporters. And it’s all because he refused to honour his own “cast iron guarantee” to hold a referendum on the Lisbon Treaty. The treaty, you will recall, is now signed, sealed and delivered. Among other things it gives us the very first President of Europe, Hermann van Rompuy, and “the most powerful woman in Europe”, an obscure Labour peer called Baroness Ashton of Upholland, who has never been elected to anything. The Treaty is the latest and biggest step down the road to a European superstate. Given half a chance, the people of Britain would vote against it. For a few months, it looked as if a new Conservative Government led by Mr Cameron might actually offer that rare opportunity. Then the treaty was ratified by all the other countries of the EU and Mr Cameron surrendered without a shot being fired. He thought it would all get too messy if Britain withdrew from the agreement after it was in place. Instead, he’s promised he won’t agree to any further attempts at “Eurocreep” – but it’s too late for that because no further treaties are necessary. Ardent Conservatives are purple with apoplexy when they look at the election results, demanding to know why anyone in their right mind would vote for the UK Independence Party. UKIP – dismissed by Mr Cameron as “fruitcakes, loonies and closet racists, mostly” – polled more than 900,000 votes at the General Election. It didn’t do them any good. They didn’t win a single seat. Even Nigel Farage, who thought he could oust the Speaker of the House of Commons, John Bercow, came down to earth with a bump. But UKIP did achieve its main aim. That was to deprive the Tories of seats they might have won without the Eurosceptic party’s intervention. Various experts estimate the Tories were, as a direct result of this, deprived of 19 or 20 seats at the General Election. Another 20 seats would have seen Mr Cameron over the line into an outright Commons majority. If he had simply honoured his original “cast iron guarantee” of a referendum on the Lisbon Treaty, most UKIP support would have melted away. The Tories would be home and dry and Nick Clegg would be yet another also-ran leader of the Liberal party. The terrible irony is that in the nauseating Parliamentary love-in we have witnessed this week, Mr Cameron has clambered into bed with the most committed Europhile party in British politics. The Lib Dems positively want a European superstate. They would sign up to the Euro tomorrow. They would willingly surrender British sovereignty to Brussels. One sceptic MP has warned: “Europe is developing into an empire, not a military or hereditary one, but an empire run in the interest of a narrow elite. These are the words of Gisela Stuart, the German-born Labour MP who was the British representative on the committee which drew up the European Convention. Ms Stuart saw what was happening at close quarters and recoiled in horror. No wonder she managed to cling onto her Birmingham Edgbaston seat when all around her Labour MPs were falling like nine-pins. If the Conservatives had adopted Ms Stuart’s tone in their approach to the EU then there would be no need for UKIP and no need for coalition politics. The irony is this was not only the Tories best chance for years to win an outright majority in a General Election but possibly their last chance ever. Now they have copped off with Mr Clegg, a former Eurocrat and Euro-MP, we may lose our first-past-the-post electoral system and get proportional representation instead. That means hung parliaments for ever, with the Lib Dems permanently holding the balance of power. Instead of the promised referendum on the Lisbon Treaty, Mr Cameron will be offering us a referendum on electoral reform. With luck, we will reject the idea of constant compromise, back-stairs deals and cobbled-together coalitions. But we might not. All this means the people who voted UKIP have actually got the very opposite of what they were hoping for. By depriving the Conservatives of an outright majority, they may have lumbered Britain with a permanent Lib Dem dictatorship. The blame rests firmly with Nick Clegg’s new best friend. Ministers, we are delightedly assured, are taking a five per cent pay cut. That is not true. All that’s happening is backbench MPs who have been jolted into the Cabinet are getting a massive pay rise – just not as massive as it would have been if they were in a Labour Government. A pay cut is when your salary goes down. What we are seeing is a reduction in the rate of pay for the job. That’s a very different thing. Employers in the private sector do it all the time when a long-standing employee leaves and they recruit a replacement. Let’s not be fooled by talk of pay cuts any more than we should be taken in by the idea that when a majority of the Commons opposes the Government the Government doesn’t have to resign. If our MPs accept the 55 per cent-against proposal, they will have proved themselves even more supine than previous Parliaments and dealt yet another blow to the fiction of Parliamentary sovereignty. Compromises are all very well but we’re supposed to be in a new era of democratic accountability – yet the first thing our new masters do is stitch up a special deal to guard their backs and protect themselves against the day they fall out of love again. It’s a marriage made in hell. Surely it can’t last. Over optimistically, the first stitch-up of the new coalition is fixed-term five-year Parliaments which means the next election is in 2015. It’s hard to believe David Cameron and Nick Clegg seriously think their new found love-in will last the course. They have bound themselves together for better or worse, for richer or poorer, for half a decade. Yet, like cynics at a shotgun wedding, everyone’s wondering if it will last a matter of months never mind years. On the very eve of the wedding day, Nick couldn’t resist one last flirtation with a Labour Party willing to dump Gordon Brown to make itself more attractive to the Mr Darcy of British politics. If was a flop. But the attraction remains. There are thousands of Lib-Dems who would like nothing better than a quick romp with a Socialist. Some of them are positively repelled by the idea that they have been forced to sell themselves to the Tories. And the feeling is mutual. For Conservatives who do not suffer from a lust for power at any price, the idea of getting into bed with the Lib-Dems is about as appealing as a night on the town with Harriet Harman. For many Tories, it is a duty to oppose the Labour Party but a positive pleasure to loathe the Liberals. In many parts of the country, the Lib Dems are the real opposition to the Conservatives. Worse still, the Lib Dems have a well-deserved reputation for fighting dirty. No blow is too low for them. Now we have the spectacle of the two parties plighting their troth to one another in a ceremony as bizarre as anything Las Vegas could conjure up. Dave was not up to it on his own; Nick was pregnant with votes. This is a forced marriage. We’re assured it’s the new way of doing things. What that means – and this is a benefit of coalition – is that the more outlandish, mad and extreme policies of the two parties will be abandoned. The Tories have dumped their promise to cut inheritance tax for the very rich; the Lib Dems have dropped their plans for a mansion tax on their homes. The Lib Dems have decided a replacement for the Trident nuclear deterrent is OK after all and they’ve ditched the notion of an amnesty for illegal immigrants. But the great Cameron give-away includes a pledge to abolish taxes for anyone earning less than £10,000 a year and a new holidays tax. Worse than that, he’s showered Mr Clegg with wedding presents – fixed-term parliaments, State funding for political parties and a referendum on “unfair voting” via a form of proportional representation. It’s no wonder the Lib Dem leader was seduced by the Tories. He was offered a pre-nuptial agreement most minor parties would die for. With a bouquet of Ministerial jobs to go with all of this, the honeymoon between the two parties should be happy and fulfilling. But like all hasty marriages, once the first fling is over and reality dawns, the chances of the couple living happily ever after will disappear rapidly. The rot sets in when they start to bicker about money. The Conservatives are determined to get on with the job of taking the axe to public spending. They don’t really have any choice because the markets will force it on them whether they like it or not. This will be painful and deeply unpopular. Mr Cameron may think he’s done himself a favour by tying the Lib Dems into this. But when Mr Clegg’s colleagues discover just how drastic and painful the cuts must be, there will be rows, tantrums and tears. For decades, Lib Dems have enjoyed the luxury of being able to promise the earth, safe in the knowledge they would never have to deliver anything. Suddenly, they’re in the spotlight and they won’t like it when their party is accused of conniving with the Conservatives to cripple the public sector. Usually, the Lib Dems get by on extravagant spending promises. Today they have bound themselves to the very opposite. In time they will complain they’re being taken for granted. As the euphoria of the wedding breakfast and the heady days of the honeymoon become distant memories and they deal with the daily drudgery of trying to dredge the economy out of the depths of despair, the Lib Dems will question why they got into this in the first place. By then, they will have committed themselves to a full five years in an unhappy relationship. A newly revived Labour Party under a new leader will present itself as “the other party”. The Lib Dems will be casting longing glances in the direction of the Labour Party even while they are stuck in this relationship with the Tories. Mr Clegg may even start talking about divorce and throw himself at Labour. It probably won’t do him any good, though – hell hath no fury like a Labour Party scorned. This coalition is a marriage of convenience. It will end in bitter divorce. What a far-sighted political genius David Cameron is. First he becomes the “heir to Blair” then he turns the Conservatives into the Liberal Party then he absorbs them into a coalition Government. Was this the outcome he was hoping for all along? Is that why he did so well in blowing his party’s best chance of winning outright victory at the General Election since 1979 (John Major didn’t have such a good chance but he won anyway)? All we need now is a stitch up over proportional representation and the Tory party might as well cease to exist for all the good it will ever do. David Cameron has let down his party. He was elected leader on the promise that his new, smiley, PC-friendly Conservatism would deliver election victory. It didn’t. He may be the next Prime Minister but he has achieved a watered-down version of power only if he can win over the Liberal Democrats and keep them on board. His failure is staggering. A year ago, he was favourite to walk it. He was competing against the most unpopular Prime Minister since Neville Chamberlain and in the midst of the worst economic crisis since, well, Neville Chamberlain. Yet his “heir to Blair” project came off the rails. The voters turned their backs on the A-list “Dave’s doxies” and UKIP’s 900,000 votes could have delivered dozens of more seats for the Tories, had they chosen to promise a referendum on the Lisbon Treaty. Nick Clegg did worse than expected. Gordon Brown did badly, as expected. David Cameron was the biggest failure of the election and yet he is about to negotiate himself into Downing Street. I have no idea what the outcome of the election might be. The polls are all over the place. One puts the Tories on 37 per cent of the vote, another on 32 per cent. One has the Lib-Dems in the lead on 33 per cent and another puts them on a mere 23 per cent. Nobody’s got a clue who will win which is why it’s all such fun (If you’re not participating and if, like me, you think the outcome won’t make much difference because we all know the next Government has only one task and that’s a nasty one). Before the campaign started I expected a Conservative majority of 30. That looks a bit unlikely now, though it still wouldn't surprise me. Still, for what it’s worth, based on a cursory study of the conflicting polls and assuming they have some veracity, here’s a prediction: Conservatives 303 seats, Labour 242, Lib-Dems 76, others 29. That would leave David Cameron with the largest party. He would have to form a minority Government and dare the Lib-Dems to bring him down. It might last 18 months or more. It’s the elephant in the room. The huge monstrous object in the corner everyone knows about and no-one wants to discuss. It’s the Government’s massive debt. On May 7, no matter who wins the election, the elephant will lumber onto centre stage. It’s a terrifying prospect because – despite endless manifestos, never-ending discussions and four and a half hours of leaders’ debates on TV – we still don’t know how it’s going to be dealt with. We borrowed £163.4 billion in the last 12 months. We owe £890 billion in total. By the end of this year, it’ll be a trillion pounds. A trillion is the sort of sum few of us can really get our heads round. It’s a very big elephant in a very small room. Actually, if you include the money the Government has spent on building new schools and hospitals and managed to hide, thanks to the Private Finance Initiative, we already owe £1.34 trillion. The next Government, whether it’s red, blue, yellow or a combination of these, has no option. It will have to start paying off the debt. At the moment, the interest on our loans comes to £35 billion a year – that’s more than we spend on defence, transport or law and order. We can’t go on like this. As every bankrupt knows, there’s a price to pay for a mindless spending spree. Just ask the Greeks – their day of reckoning has arrived and the country is in turmoil. Their debt has been downgraded to junk making the home of democracy Europe’s first sub-prime borrower. Public sector workers are taking big pay cuts – 30 per cent in some cases – taxes are rising and jobs are disappearing. Protesters are taking to the streets. We’re not as badly off as Greece mainly because we aren’t in the euro (one of the decisions Gordon Brown got right was to resist Tony Blair’s desperate desire to sign up to the straightjacket currency). But our debts have to be tackled and, when we go to the polls next Thursday, we really won’t have a clue what our politicians will do. Worse than that, it doesn’t really make much difference who we elect. The crisis will be the same and the cuts will be similar. The Institute for Fiscal Studies reckons there are massive black holes in each party’s plans. The Conservatives, according to the IFS, can’t account for £59.4 billion of cuts and tax increases. Labour can’t account for £47 billion. The Lib-Dems are £42.7 billion short. Whoever wins, according to the experts, we face the biggest public spending cuts for decades. That’s on top of tax increases which will come to £15.8 billion under Labour, £10.1 billion under the Tories and £19.7 billion under the Lib-Dems. Call me a bigot but I’d say the truly bizarre aspect of this election campaign has been the refusal of the parties to address these issues openly and honestly. Cast your mind back to the days before Cleggmania swept everything before it and you will find Labour and the Tories arguing earnestly over a £6 billion increase in National Insurance. “A tax on jobs,” they said, claiming to have identified ways of saving enough money to reverse the increase. But it’s a sideshow. They’re squabbling about £6 billion. They should be debating how to fill a gaping hole worth maybe ten times that much. It’s partly our fault the parties have carefully skirted round the subject. When the Tories warned we were facing “an age of austerity” their poll ratings fell and they’ve never really recovered. We are as bad as our political leaders. We don’t want to know. We can’t really face the consequences and we’re likely to vote against anyone who puts it to us straight. You can’t put all the blame on the parties. They’re fighting an election. They all want to win. Like the Marxist-style cover to the Labour manifesto, with its happy family looking over the green countryside to the new dawn, they want us to believe things can only get better. It won’t be like that. Cuts will be drastic. A hit-list from the Taxpayers’ Alliance gives us some idea of what we’re facing. They say child benefit and free bus passes for pensioners should be abolished. Some public-sector workers should have a 15 per cent pay cut, the rest should have a pay freeze and their pension contributions should rise 30 per cent. The Taxpayers’ Alliance wants state pensions frozen, ten per cent of public sector jobs to go and the interest subsidy on student loans abolished. Taxes will rise – everyone thinks VAT will hit 20 per cent yet no politician is prepared to admit it – and we may well dip back into recession. I am absolutely convinced the next Government faces widespread civil unrest – strikes, protests, riots – as reality bites. This is not an elephant in the room, it’s a stampeding herd of elephants charging towards us while our leaders point in the opposite direction and pretend everything’s OK.
We won’t know what hit us when, after the election, we all get trampled under foot. • It probably took about three minutes to read this article. In that time, the national debt increased by £930,636.